Here in Minneapolis, students and professors have returned to class, the temperatures are plummeting, and the leaves on the trees are changing from green to red. That can only mean one thing, election season is here again, but this time around, it looks to be a lot more interesting. Ty Moore is running in the 9th ward of the Minneapolis city council on the Socialist Alternative ticket. The campaign has been endorsed by many prominent local activists, the SEIU Minnesota State Council, and the Green Party. Moore has been on the front line of the Occupy Homes struggle, a movement that has successfully stopped several evictions with mass actions and civil disobedience—one of which he was arrested at. While there is certainly nothing new about socialist electoral campaigns, this one has been getting a lot of buzz in the local papers. Moore and his campaign stands on the shoulders of another Socialist Alternative candidate, Kshama Sawant, in Seattle. In last year’s elections, Sawant received over 20,000 votes (29%) against House Democratic incumbent Frank Chopp, which was not only the largest number of votes an openly socialist campaign had won in Seattle in decades but also the greatest electoral challenge Chopp had received in all the 18 years he was in office. But even those figures pale in comparison to those in the August elections of this year, when Sawant won over 44,000 votes (35%) in a three-way race against two Democrats in the Seattle city council election. While we in Socialist Action are critical of Socialist Alternative’s Green Party endorsement, since the Greens are a pro-capitalist organization, we see any openly socialist campaign as a step forward for working-class independence. 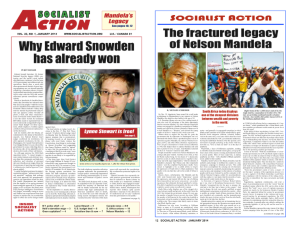 Socialist Action views Socialist Alternative’s electoral successes as a big opportunity for working-class candidates to step up to the plate and challenge the Democrats on their own turf. Socialist Action critically supports all of Socialist Alternative’s candidates—including Kshama Sawant in Seattle, Seamus Whelan in Boston, and Ty Moore in Minneapolis. October 1, 2013 in Elections.